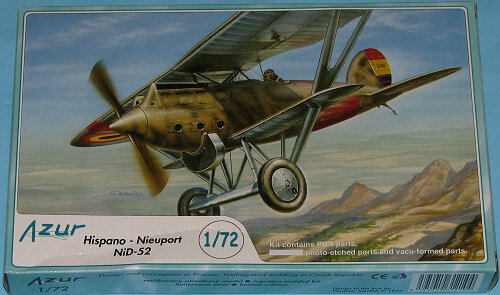 The Neiuport-Delage NiD 42 was chosen by the Spanish Air Force as their new fighter in the late 1920's Before a contract was signed for license production, the NiD 52 was offered and so chosen. The 52 was improved by offering a metal skinned fuselage and metal wing framing. Production began at the Hispano-Suiza factory in Guadalajara in 1929, with the first 34 aircraft constructed of French provided parts. Another 125 aircraft were built with local materials. When the civil war broke out, an additional 10 aircraft were provided as attrition replacements and delivered in 1936. At the start of the civil war, the Republican forces had 48 of these aircraft and the Nationals had 8. At the time, it was the most powerful fighter available to either side until foreign governments started supplying aircraft. For both sides it was the NiD 52 that scored their first aerial victories. Once newer planes were provided, the NiD 52 was relegated to observation duties, the last battle in which the aircraft participated was in the Spring of 1937 at Guadalajara. By that time, most remaining aircraft had been turned over to training duties. Molded in MPM/Special Hobby/Azur's medium grey, the detail work on this kit is very nice. You can see that there is some 'hill and valley' work on the fabric covered bits, but it is not excessive. The kit is quite simple, even more so as several airframe parts are not used, obviously in preparation for another variant. There were no molding defects at all that I could see, a nice treat. Resin is used for the cockpit components and some smaller airframe bits like scoops, guns and the large chin oil cooler. Photo etch (not shown) is for some hinges, instrument panels and belts. Acetate is provided for the windscreen and for instruments. The instructions are well done and give color information in generic, Gunze and another paint that is not identified, but may well be Agama. There are markings options for three aircraft. All of them are Republican aircraft with a base aluminum color and large red bands on the wings and fuselage. These latter items need to be painted by the builder. 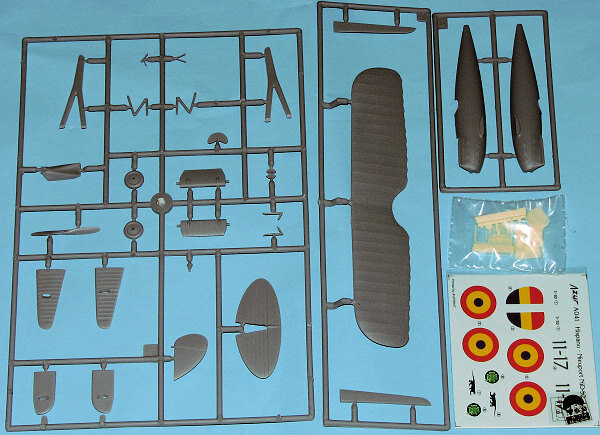 Option one is the box art plane in 1937 with sand upper surfaces that are mottled in a khaki green. This aircraft has no upper wing roundels. The second option is from 1936 with 13 Squadron near Barcelona. The third is with 11 Gruppo in 1936. The decals are well printed and should provide no problems. It is always nice to see interesting aircraft like this being produced. This looks like a good one and the best thing is that it doesn't have much in the way of rigging. It would be a great introduction to short run kits and get a builder used to using resin and photo etch.